HTC to Introduce “What’s Next” on September 1 in London, Vigor and Beats News Expected? 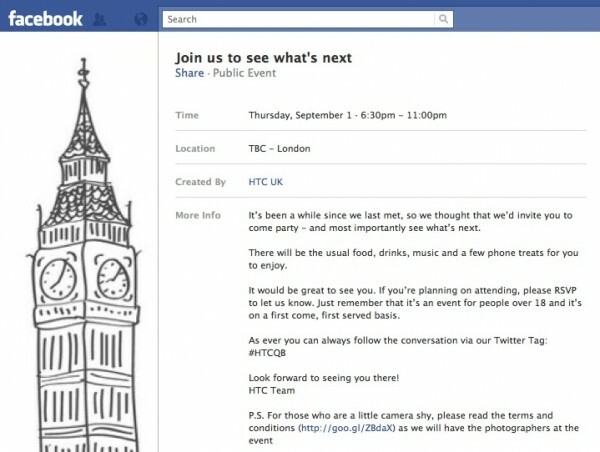 HTC has announced on Facebook, an event for September 1 to unveil “what’s next” or what we are thinking is their next lineup of products. Anything in particular we can expect to see? Well, we have the HTC Vigor to think about. The rumored Verizon device that our sources have told us will rock a 4.3″ HD (1280×720) screen, 1.5GHz dual-core processor, 1GB of RAM, 16GB internal storage, dual cameras, Android 2.3.4 and a brand new version of Sense (3.5). There is also a good chance that they will announce their Puccini 10″ tablet aka the JetStream. This should be the first 10″ Honeycomb tablet to be fully skinned by an OEM – the newest version of Sense for tablets is expected. All signs point to this tablet landing on AT&T as one of their first LTE devices. And of course, we can’t forget about HTC’s new partnership with Beats by Dre. The 9/1 event should be a great opportunity for HTC to produce more insight into how Beats integration will work with their upcoming handsets. After all, they did say that we would see Beats devices this fall. Other than that, it’s pretty much a toss up. With Samsung expected to be manufacturing the next Nexus instead of HTC, we likely won’t get news on that front. We are hoping to hear some talk of their plans to introduce an Ice Cream Sandwich device though, since this will be their opportunity to announce Q4 releases. Samsung Nexus Prime Seen Roaming The Halls Of Verizon?